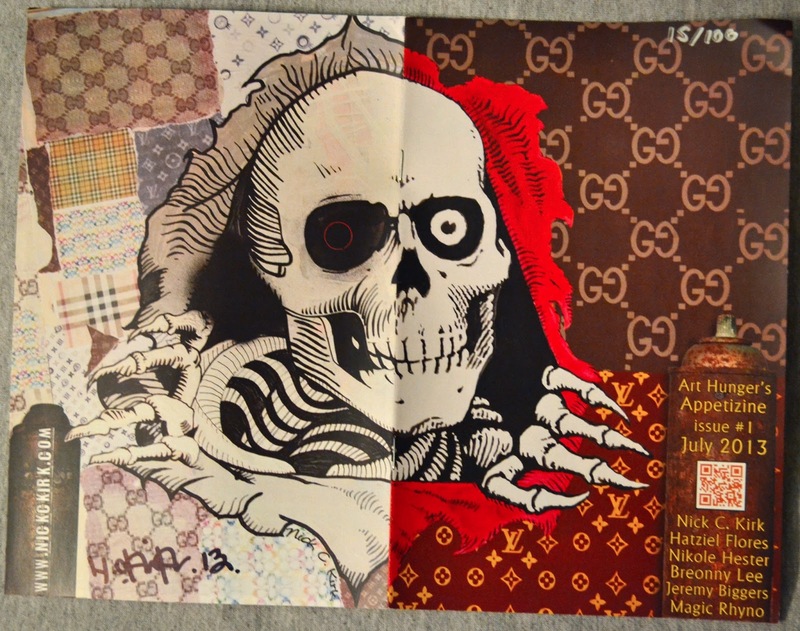 Art-Hunger monthly zine: Appetizine. Containing local Texas Artists. Fort Worth Dallas Texas. Art-Hunger Appetizine issue #1 2013. Fort Worth Dallas Texas based publication. 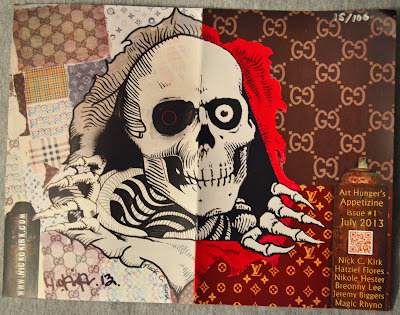 Spread by artist Nick C. Kirk. Art-Hunger Appetizine issue #1 2013. Fort Worth Dallas Texas based publication. Spread by artist Rhyno Hall. 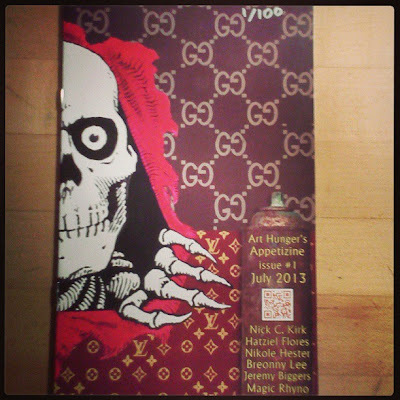 Art-Hunger Appetizine issue #1 2013. Fort Worth Dallas Texas based publication. Spread by artist Hatziel Flores. In case you missed the premier of the zine at the Urban Legends show in Dallas, you may still get your copy by purchasing from our online store for just 7.00 and 3.00 shipping. The purpose of the Appetizine is to promote Texas artists by offering an inexpensive article for sell to those wishing to collect local art as well as specific artists work. 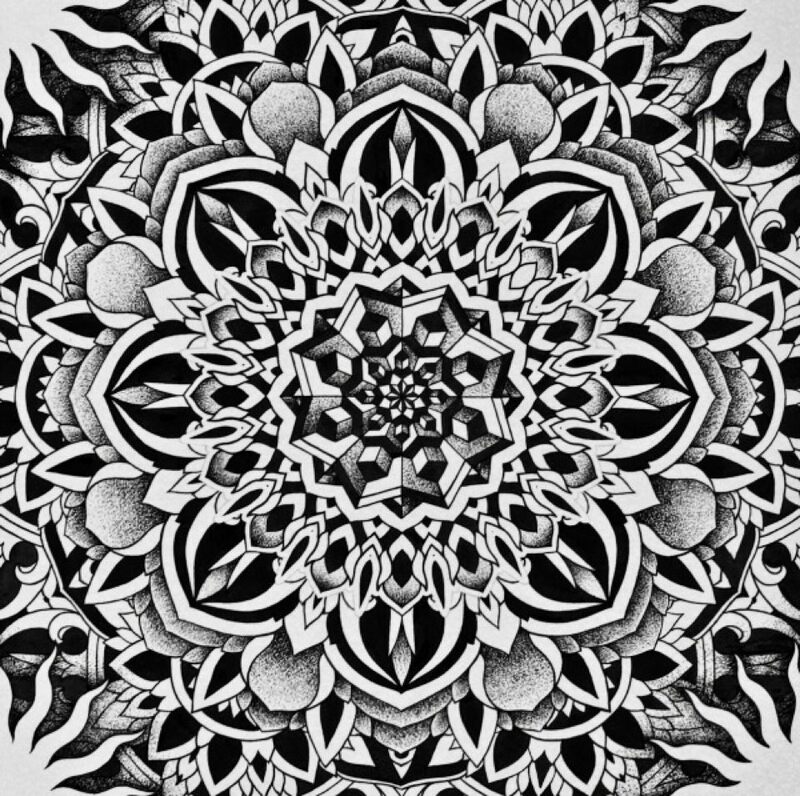 I don't know of any artists prints selling for $7.00 or less. In each issue you will get 5-6 artist limited prints basically. The zines retail for little more than what it costs to have them made. The zines will be full color (except when we have a black and white edition) and will promote 5-6 artists per issue. Each artist has a two page spread. Each issue will be limited to 100 pieces. The first 25 issues will (hopefully) be signed by the artists, each zine will be hand numbered. We expect to produce a new issue every other month! If you are an artist which exhibits by way of audio or video such as a musician, singer, MC, DJ, videographer, etc - please submit your file(s) via cd or dvd to the above address. We will be adding a cd/dvd in the next issues promoting audio/video artists. 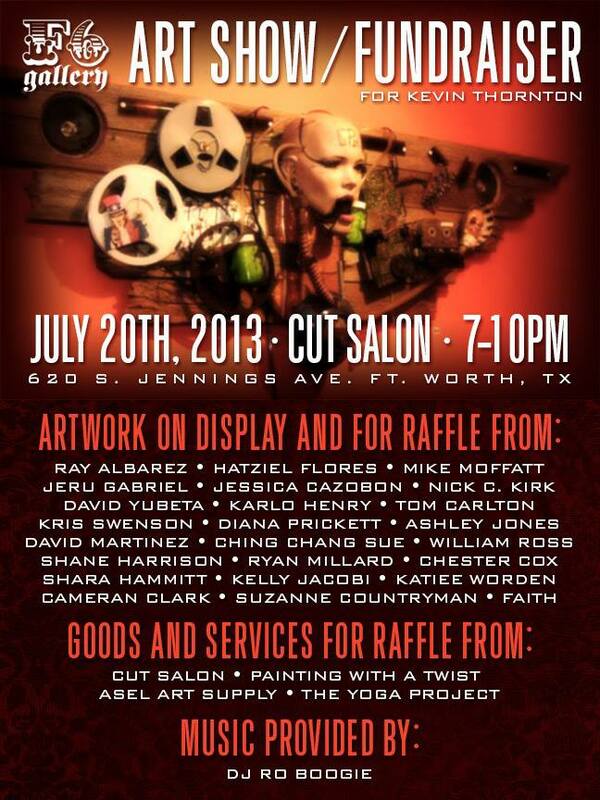 F6 Gallery Collective Arlington Texas hosts fundraiser art show / auction for one of their founders. In Arlington there is a show hosted by F6. This exhibit will have many local artists donating their artwork for great prices in hopes to raise money for one of the original founders of the group, Kevin Thorton. Find out more about this exhibit. This event is FREE! Breonny Lee exhibits new photography at her very first solo exhibition at Absinthe Lounge in Dallas Texas. 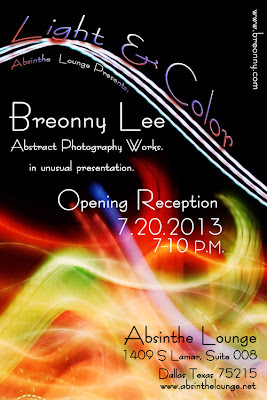 In Dallas, Breonny Lee will be showing off some new photography at her solo exhibit at South Side Lamar's Absinthe Lounge. DJ Spectra will be spinning acid jazz and house throughout the event. find out more about Light & Color. This event is FREE! 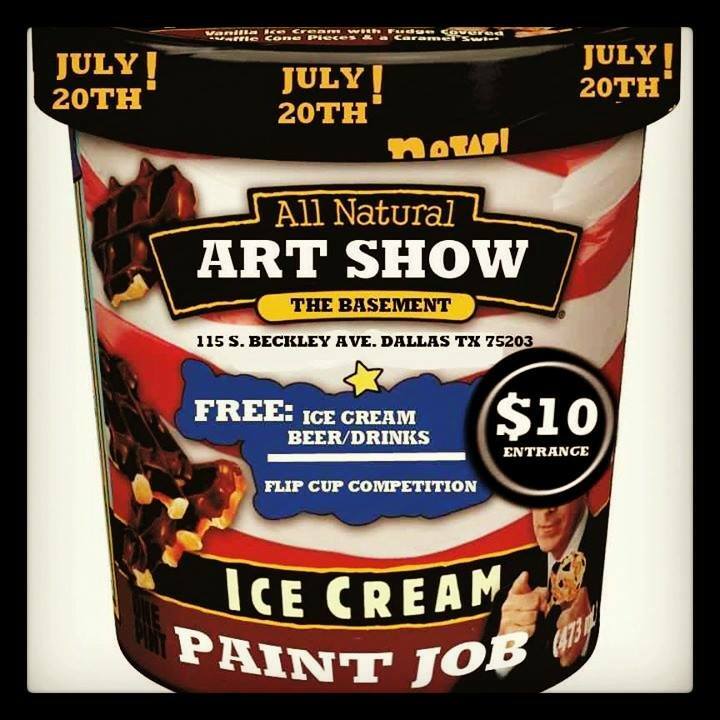 The Basement Gallery Oakcliff Dallas Ice Cream Paint Job themed show. The Gallery at Midtown is also having their monthly walk. Artwork of several talented artists exhibiting including Fort Worth artist, Sarah Ayala at The Museum of Geometric and MADI Art. Find out more about this event. Art-Hunger's first edition of Appetizine! Hatziel Flores, Nikole Hester, Breonny Lee, Jeremy Biggers, Magic Rhyno. URBAN LEGENDS — Art-Hunger’s One Year Anniversary Show. Art-Hunger is a Fort Worth/Dallas organization for both emerging and established artists who have the desire to show and sell their artwork, network, socialize, share, learn, practice skills, and gain exposure. We're hosting our one-year anniversary show in Deep Ellum—spread across FIVE separate venues in the 2600 block of Main Street. Prepare for sensory overload as you explore 70 visual artists, live fashion presentations, local bands, DJs, food trucks, and more! 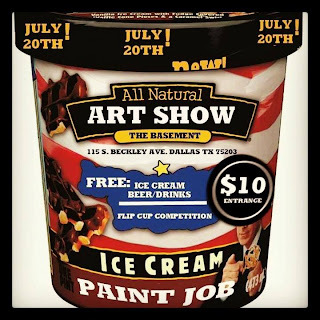 There will be raffles, give-aways, live auctions, live painting, and an outside-art free-wall for demonstrations and for onlookers to try their own hand at painting. Each venue will have a different vibe as eclectic as Deep Ellum—from a fine art gallery style setting, to market style artist booths, one-day artist installations, a runway fashion show, a break dance competition, and live musical performances ranging from rock’n’roll to indie to metal to hip hop. Art-Hunger is turning ONE this July and we're doing it BIG!! If you are interested in participating in this event, please contact Nick at nick@art-hunger.com . 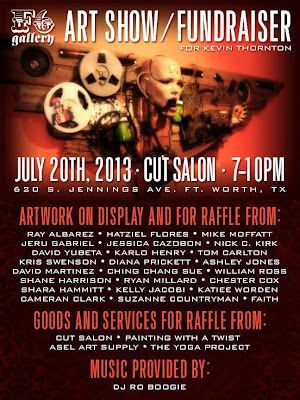 Artists may also head over to www.art-hunger.com and register for a booth space or wall space. Sponsors, bands, and businesses please send inquiry to Nick (above) for information on how to sign up and promote your business during the event. Art-Hunger is organized and run by local artists and art lovers who donate their time, skills, and resources to make these events possible. (Read: the generous team that makes Art-Hunger possible does not make any profit.) The anniversary show will be our primary fundraiser for the upcoming year. All monies raised will go directly back into providing inexpensive and free opportunities for artists to show and sell their artwork. 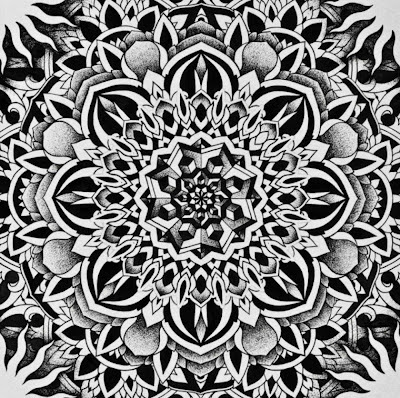 Our mission is to further each artist's dream and passion of making art. All registration fees go to venues, advertising, and materials for each event. Not only do we host dozens of shows around the metroplex, we also venture out of city, state, and country! 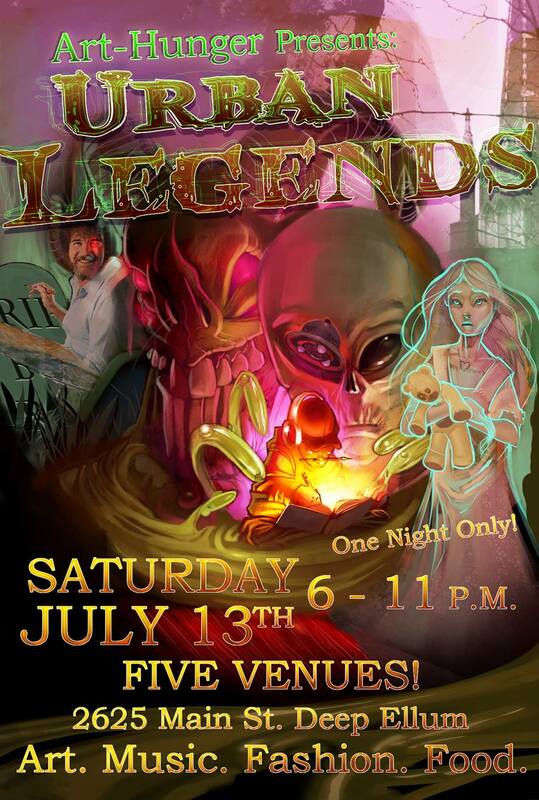 Entry to all 5 venues is only 5.00 for the entire night! First 50 guests will receive a gift bag! We will post more artists participants, bands and sponsors every week. Just a heads up, the next PANCAKES & BOOZE ART SHOW in DALLAS will be November 15th, 2013!!! Please send an email to PANCAKESANDBOOZE@GMAIL.COM if you're interested in exhibiting work!!! Please include your name, city of the show, and mention that you're an artist who has previously taken part in P&B!! !